Up for Grabs is a microgame in WarioWare: Smooth Moves appearing in Mona and Jimmy T.'s stage. 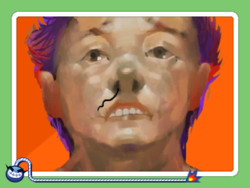 This microgame returns in WarioWare Gold in Kat and Ana's stage, though it only involves pulling nose hairs off a man using the stylus. The term "up for grabs" refers to anything that is available to claim. The player must grab a certain object and pull it out of whatever it is in. 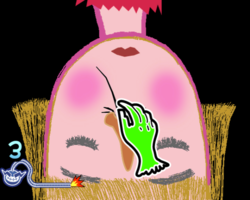 1st level difficulty: The player must pull out a nose hair from a girl's nose which will reveal a green banana coming out. In Gold, the girl is replaced by a man, and nothing comes out of the nose. 2nd level difficulty: The player must tug a remote control out of a boy's grip so that he can go to bed. In Gold, the player must pull out two nose hairs. 3rd level difficulty: The player must tug free two girls who are stuck in a box. In Gold, the player must pull out three nose hairs. This page was last edited on December 19, 2018, at 01:18.